In the previous chapter, we took at look at Fuse's Navigator and Router classes and used them to tie our app's views together and send data between them. However, up until this point, our EditHikePage hasn't been able to actually make any lasting changes to our data model. For example, if we select a hike and make changes to it, then navigate to another hike, and navigate back, the changes we made will have been lost. This is because these changes are only made locally in EditHikePage's view model, and never make their way back to our model. But now that we've got much more of our architecture figured out, it's time to start tackling this problem. We'll do so by implementing a mock backend, which is a module that will act like a real backend, but will just store some data locally in our running app instead of persisting it on the device's storage or in a database somewhere. Building a mock backend like this isn't strictly necessary when building an app with Fuse. We could just as well pick an existing backend solution, for example, and build our app against that directly. But because this tutorial is meant to be as general as possible, we want to present these concepts in a general, backend-agnostic way so we can focus on the core concepts rather than the details of a specific backend. This will be a good exercise to do at least once so that we can understand what to expect when hooking our app up to a real backend in the future, regardless of which backend solution is actually used. Note: once we've finished publishing this tutorial series, we'll be extending it with various "tracks" that will cover replacing our mock backend with integration with specific backend solutions, as well as many other cool things, so stay tuned for that! Additionally, we'll create a thin abstraction over the mock backend which our view models will interact with instead of using the mock backend directly. This way, if we change how our mock backend works or replace it with a real backend, none of our view models should have to change; we can just update our abstraction to interact with the new backend and still provide the same interface it did before. We can also take advantage of having this abstraction by filling in features our [mock] backend might not have, such as object caching. But before we start building anything, we need to consider what the interface to a typical backend might look like. So let's dive in and take a look! To properly use a Promise, we have to introduce some of our own asynchronous code. The simplest way to interact with a Promise is by calling two of the functions it provides: then and catch. By calling the then function, we can describe what will happen when the Promise is fulfilled. We do this by passing in another function that optionally accepts the value the Promise is fulfilled with; in this case, the items from the backend. This argument is optional, though. For example, in the case of our updateItem function, the Promise it returns isn't meant to yield a value when the update is complete. We only care about whether or not the Promise was actually completed, so the argument wouldn't be used in this case. By calling the catch function, we can describe what will happen if an error occured while trying to fulfill the Promise. In this case, we can pass in a function that accepts a description of what caused the failure. For example, a real backend might report an error if it can't connect to the backend server, or authentication failed. Error detection/handling is a complex topic, however, so for the sake of keeping things simple, we're going to skim over a lot of these details. But we'll still want to attach some simple error handlers to our Promises so we have them if we hook up to a real backend later. There are many more features Promises provide, and they're very useful. But this short description should clarify all we need to know to build and use our mock backend, as well as grok the interfaces of real backends later on. Now, some of you might have noticed something interesting, and that is how similar Promises look to Fuse's Observables that we've already been using. An Observable represents a value that can be changed and observed, which also fits for our asynchronous interface. Indeed, if we wanted, we could use Observables instead of Promises to mock our backend interface, as their semantics are quite similar. And, if you're building a backend that targets Fuse specifically, this is encouraged, as it makes integration with your backend trivial! However, since many backend solutions have been built to support more platforms than Fuse, it's highly likely that we'll be interacting with an interface that gives us Promises instead, so we'll want to design our mock as if that were the case. Fortunately, because of the similarities between Promises and Observables, bridging the gap between the two is pretty straightforward, as we'll see later. Note: you can learn more about Promises in this guide over at MDN, and the A+ promise standard which describes the flavor of Promises that Fuse conforms to specifically. All in all, using Promises, we've arrived at a fairly good approximation of what a typical JS-based backend interface will look like, so this is what we'll use to model our mock backend. Note: Keep in mind that we'll be moving things around a bit in our project, so we won't be able to compile and/or preview for a while, but we'll be back up and running by the end of the chapter. Now we're ready to start implementing our mock backend. Since our old hikes.js file already contains all the data we'll need to present, we can use it as a starting point. First, we'll move the file into our Modules directory, and then we'll rename it to Backend.js. Now, instead of returning the hikes array, we create a Promise using new Promise. The Promise constructor takes in a function that will be called in order to fulfill or reject the promise. This function takes in two arguments: resolve, and reject. These arguments are actually functions themselves. resolve is a function that fulfills the Promise we're creating, and if we attached a handler to our Promise using its then function, that handler will be called. In our code, this is all our function needs to call in order to resolve our Promise with our hikes collection. The reject function can be called instead if an error occurs, and any handlers we attached to our Promise via catch will subsequently be called. Perfect, now we've got a nice getHikes function with a proper interface and some optional simulated delay! In this case, we'll use the id argument to identify the hike we want to update, and the rest of the arguments will be used to overwrite all of the corresponding fields on that hike. And with that, our mock backend is complete! As I mentioned earler, we could have our view models interact with our mock backend directly. While there's technically nothing wrong with that, it tends to be beneficial to build a small abstraction layer over the backend that our view models interact with instead. This helps us provide a more consistent interface to our model, and also allows us to implement things like caching to help reduce the amount of bandwidth and battery our app uses. So, the next thing we'll do is build this abstraction, which we'll call the Context. Notice how we imported the Backend module as ./Backend. Normally, when importing JS modules that are bundled in our app, we use the require expression and specify a path relative to our project's root directory to resolve the module. However, we can use relative paths to resolve a module as well. In this case, that's exactly what we're doing - we know Backend.js is in our Modules directory, which is the same directory as our Context.js file. So, using ./Backend works just fine. This Observable will be used by our view models to display all of the available hikes. When our app starts up, we'll populate this Observable using data from our backend, and as our app runs, this collection will essentially be a local mirror of the same collection in the backend. As we make changes, we'll update the contents of this collection so that our view models will get updated instantly. We'll also communicate with the backend, so it can update its information asynchronously. Notice how we use the replaceAll function on our hikes Observable to overwrite its contents with the contents of the array we get when our Promise is fulfilled. We've also attached a small error handler for good measure. 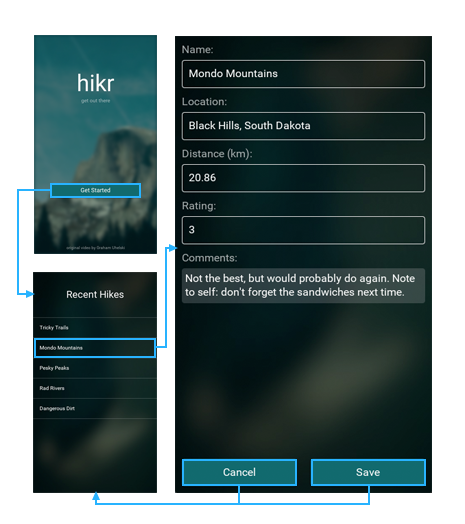 This takes care of filling our hikes Observable with initial data from the backend on startup. And with that, we've finished our Context module as well! Now that we've got our Backend and Context modules set up, it's time to refactor our view models to use these instead of the hikes module that we had before. And that should cover our HomePage. We'll start with the Save button. This button will be almost identical to the Back button we made previously, except that it will also commit the changes made in the editor to our data model in addition to going back to the previous page. So, let's start by simply renaming the existing Back button to Save. Great! Now our Save button should be all hooked up. Now, let's implement the Cancel button as well. The Cancel button will be very similar to our Save button, except we'll have to cancel the changes we've made in the editor somehow. But before we worry about that detail, let's go ahead and make our Cancel button, along with a corresponding cancel handler for it. Perfect! Now everything should be hooked up. At this point, we can go ahead and save all of our different files. Once Fuse is finished reloading preview, we finally can try out our fully-functional views! Now that all of the major parts of our app are in place, it's time to iteratively tweak the look and feel of our app to really make it pop. In the next chapter, we'll build various reusable components with a custom look/feel and sprinkle them all over our app to polish the app and make it look great. So let's get to it!